Liberal Bohemian: The Strength of Old Hickory: Andrew Jackson. The Strength of Old Hickory: Andrew Jackson. In 1811 on this same day in Louisiana, 500 slaves led by a man named Charles, and inspired by the successful revolt of slaves in Haiti, attempt their own uprising. The revolt lasted only two days. Then, in Louisiana on this same day in 1815, Andrew Jackson and his 4000 soldiers defeated 10,000 British troops using the war tactics Jackson had learned slaughtering Native Americans as a young soldier. The "savagely" Jackson had learned from the Native Americans earned him the title of "Old Hickory." Unfortunately, the Jackson story doesn't stop there, for Jackson had his eye on the Cherokee territory in what is now Georgia, and his supporters knew he would do whatever it took to gain it. George Washington himself had promised the land to the Cherokee people in 1794, but in the late 1820's the southern states began to pressure the federal government to remove them and when it didn't, they recruited Old Hickory himself to run for president. 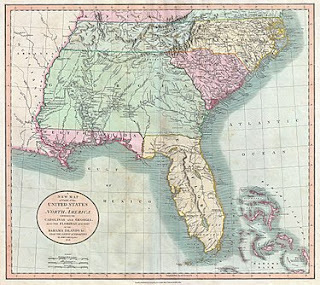 Jackson ran for the Oval Office in 1828 and won when voters in Alabama, Mississippi, Georgia, and Tennessee provided him the large popular vote mandate he needed to effect radical changes in the settlement of Indians on federal territories. Jackson had promised a peaceful removal, the reality was to be quite different. Those who knew him best, especially those who knew him as "Old Hickory," understood that his portrayal of Indian relocation as a voluntary migration was a fiction designed to obscure the harsh reality of what the displacement would do the families of the Native Americans. In his own words, Jackson said, "...what good man would prefer a country covered with forests and ranged by a few thousand savages to our extensive Republic, studded with cities, towns, and prosperous farms...."
The Native Americans refused to sell their territory to the United States or to Georgia, so the state government responded by seizing their property and compelling them to move to another location. Is it any wonder we live in a country fearful of its own government? In other EsotericNews, just a few days ago, March 3 to be exact, a cattle farmer in New Zealand captures the latest arrivals of three UFO's. The 8th card of the Major Arcana is Strength or Courage, which depicts a graceful queen taming a furious lion. The queen symbolizes the female Magician who can master rebellious energies and stands for moral as well as physical strength. 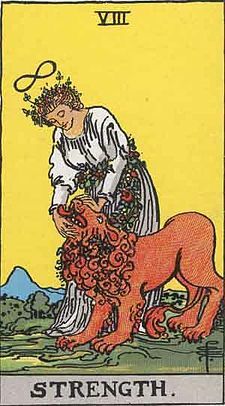 This card's positive attribute include charisma and determination to succeed; the negative qualities include complacency and the misuse of power. January 8th is The New Year of the Druids and sacred to the Roman Justira (Themis), the goddess who carries the scales of justice and personifies law and order. In Rome, Justita was thought to be present at all social gatherings and oath-swearing ceremonies. I n Greek Macedonia, this was Midwife's Day, dedicated to Eleithyia, the goddess of birth. Born on this day in 1947 was David Jones. The theratrical rock-star who would changed his name to David Bowie because he had the same name as the 60's popular pop-star with the band called the Monkeys named David Jones. 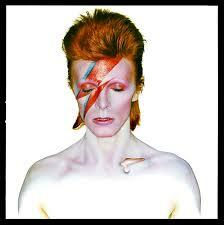 Bowie had chosen his name, so it goes, because it rymhed with "Showy." The Magician card, star gazing, and 9-11. Oldie but goodie! Shakespeare wrote the bible! The ghost of John McCausland. Judgment Day and The Evil Doers. The Tower Over January 16. Satan, Rollings Stones, and Donkeys. Thomas Paine Liberal Quotes for Trump. Meltdown Bug or False Flag? 5th day of the year; the Hierophant card. Trump Tweets, Ruby, Lewis and Clark! Oh my.